Fast growing willow is a really useful plant, and we can do literally hundreds of things with it. Its pollen is one the first feed of the bees in spring. It can be a hedge or a shade-tree. Its bark is medicinal. The fresh shots can be used as mulch and fodder or even as food. Not just baskets and furnitures be woven from its rod, but living structures be be built too. 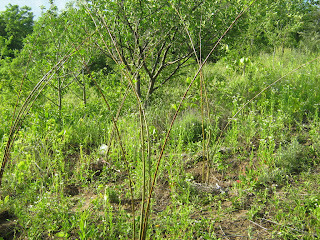 For a willow-building, we need older, more year old willow-rods, 1-4 cm thick and 3-6 m long, as the older rods can enroot easier. The rods have to be tied into bundle before planting. If we want longer bundles, 8-12 m long, we have to append newer ones to them overlapping 1-3 m.
The long bundles must be at least 25 cm thick. It should be strait, the curved ones have no strength, so we have to tie them on a horizontal surface. We put together the bottom of the rod, and tie them temporary together. Then stick newer rods into it, until the the bundle become full. We make the final tie with wire: The ropes don't last enough long, they become loose in the rain. They should be tied at every 60 cm. I always desired such a structure. 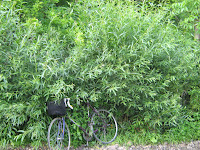 My neighbour had a very nice willow-hedge. The next photo is the hedge of an other neighbour. 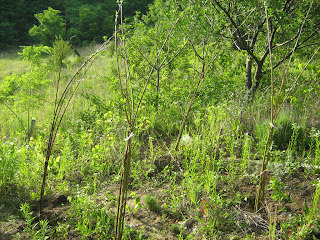 It has 80 - 100 cm long new shoots, because there is a wet ditch beside it. Medlar and nut trees look out above it. I wanted to ask him for a few of their wonderful long new shoots. But in this spring, as I went out to the garden, all the willows disappeared. The neighbour had not simply cut them back, but had dug their root out deeply. What a nut. I was sorry about them, but I walked to the garbage, found the murdered willows, and I saved two dozen rods. It was in march, when I had no time to deal with them, so I put the whole bunch into a bucket of water. Later the weather was hot, or I was busy, and they waited there till the last Sunday. The weather was good, i.e. cold and rainy, and I had an hour of free time. Some time ago I promised my wife making I would make her a meditation place in our garden. Perhaps, I thought, it can be made from willow. The time of the willow-sanctuary came. The sanctuary will be 1,5 m x 1,5 m square. A willow-bundle will grow from each corner, and they will bend together on the middle above the square, forming a living archlike structure. 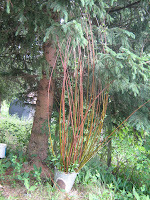 I selected 16 still living willow-rods from the bucket planing 4 rods for each corner. They were 1 year old, about 2 m long, and 1-2 thick. I did not tie them into bundle, because the tied bundle may be harder to put the narrow planting hole. The corners were marked out by digging a spadeful tops soil out from each of them. The soil is hard bellow the top soil, so I hammered a 2 cm thick iron-bar in 40 cm deep in it to make holes. The willow rods were stuck in these holes. Then the rods were tied together and watered. Now we wait them to grow. They are not long enough to tie together, so a bit later, when the roots get rooted, the bundles will be extended with new rods. The first two photos are from Willow Building Booklet (Kis Fűzépítési Útmutató). I like it. It is Hungarian, but its pictures show a lot. Some pictures of the Auerworldpalast from the page of Gruppe Sanfte Strukturen (Soft Structures Groop).